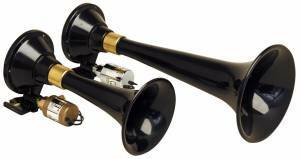 These train horns are designed for durability, easy fit and extreme sound. The ABS trumpets with extra-wide bells produce a bone-rattling locomotive horn blast that can be felt as well as heard. The 220's feature two separate mounting air horns each with their own solenoids. Two separate mounting air horns - 10.5" and 15.5"